Barta a Cihlar Ltd. was founded in Roznov pod Radhostem in the year 1994. Its field of activity can be divided into these sections: surface coatings and technologies, production and distribution of high purity chemicals (www.ebac.cz) and instrumental analytical services. All of these activities belong to the company's basic stock of the work from the early beginning. We are striving with our production and services to take up again the production of former Tesla industry, the producer of microelectronics and vacuum systems. That is why we dispose of modern powered equipment, many years of experience and in-depth knowledge and ability of our employees. That all obliges us to provide high quality and reliable production to our customers. Except the processes we are operate at the moment we are still finding and trying to develop new processes and technologies those allow us to improve our efficiency and quality. That is why we are able to offer Hi Tech and progressive services to all of our customers either in Czech Republic or whenever around the world. 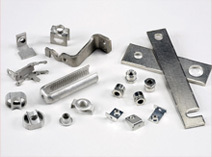 Electroless nickel plating, or "EN"
- an auto-catalytic chemical process of metal alloy nickel-phosphorous (P content 2 - 14%) deposition on a substrate such a metal or plastic. An achieving of compact and uniform layer even by the shape-complicated parts and with the possible hardness close to the hard chrome values (up to 1015 HV01) are advantageous. - mainly a decorative coating of semi-bright to bright appearance with wide scale of usage in consumer industry and engineering. - one of functional coatings to improve natural properties of the coated metal parts. It is mainly used for formation of well conductive and solderable surfaces in microelectronics. Due to its special non-toxicity it also finds much utilization in gastronomy and food processing industry. - a process to modify appearance and significantly improve the corrosion protection of the treated parts. It is mostly used for the final treatment of machined and heat-shaped stainless steel products. The passivation creates a thin, uniform transparent oxide layer on the top. That helps protect the surface from the selective corrosion and provides with uniform, pearl-bright (satin) decorative appearance. - being used as a under layer before gold plating or eventually as a final top coating for special applications. It is mainly a functional coating, but it can be used as decorative coating too. The main goal of this technology is to create an electric conductive and solderable layer on the top of the electronic components but it can be also used as a suitable final coating for following passivation. - a special technology that was developed for precipitation of conductive layer on the nonconductive substrate. In most cases that substrate is made of glass, ABS plastics, PU foams etc. After the silvering those objects are enabled to be plated with a wide range of common galvanic (electrochemical) processes or as such can be used as a final bright coating with high reflectance. - being used as functional coating in microelectronics to obtain a high conductive coating with an excellent chemical resistance. But it can be applied for decorative and representative purposes too. - an electrolytic passivation that increases the thickness of natural oxide layer on the surface and form uniform and compact oxide which is harder and more chemically resistant than a pure metal. The final micro-foam structure increases adhesion, lubricant acceptation and dye absorption which is utilized for following colouring. - are chemical treatments to achieve a change in visual and surface properties of glass objects. It is mainly used for formation of glass abrasive surfaces for different purposes but it can be also instrumental to produce matt surfaces for decorative and other functional usage. - a sequence of chemical processes for silicon surface cleaning of metal and non-metallic impurities as oxides and other chemical compounds. The main goal of this technology is to obtain a pure silicon material which is suitable for following fabrication as a secondary source for photovoltaic applications.